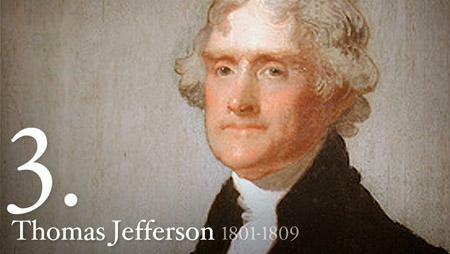 Thomas Jefferson was born APRIL 13, 1743. 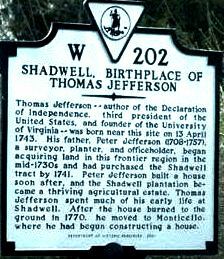 He drafted the Declaration of Independence, 1776; was Governor of Virginia, 1779-1781; and founded the University of Virginia in 1819. 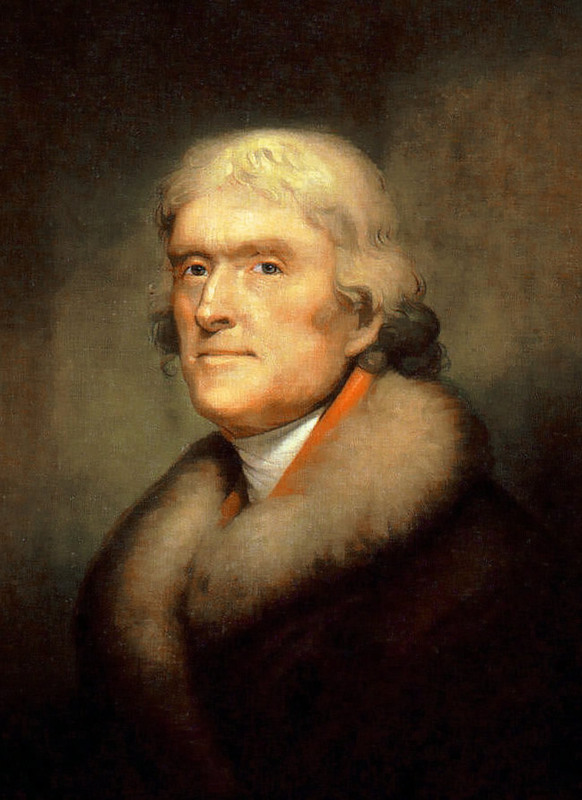 While U.S. Minister to France, 1785-1789, Jefferson met with the Muslim Ambassador from Tripoli to negotiate freeing hundreds of captured U.S. sailors held in dungeons. 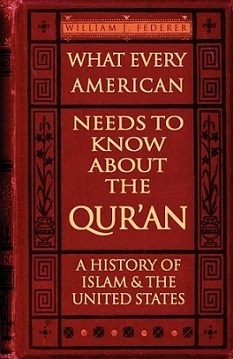 "The ambassador answered us that it was written in their Koran, that all nations which had not acknowledged the Prophet were sinners, whom it was the right and duty of the faithful to plunder and enslave; and every mussulman who was slain in this warfare was sure to go to paradise." 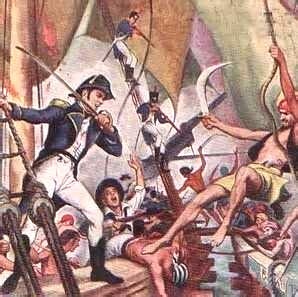 Jefferson, in 1788, arranged for John Paul Jones to fight for Russia against the Muslim Ottoman navy. 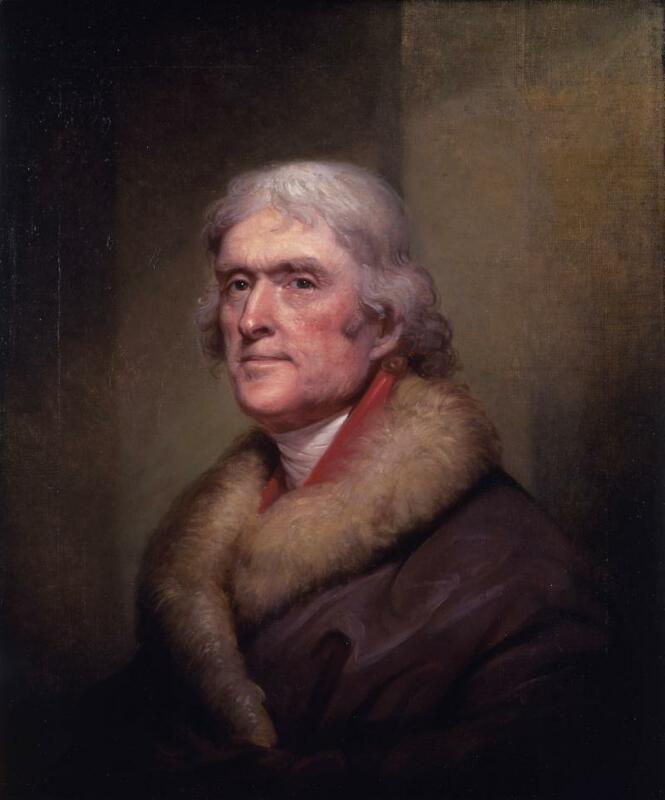 Jefferson was Secretary of State under President Washington, 1790-1793; and Vice-President under John Adams, 1797-1801. 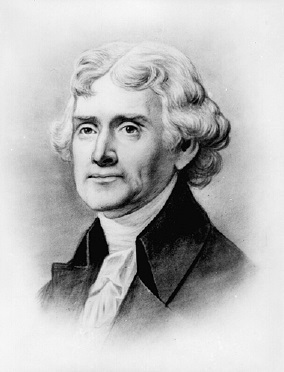 Immediately after being inaugurated the third U.S. President, Jefferson received a demand from the Muslim Pasha of Tripoli for $225,000 as an extortion tribute payment or he would declare war on the United States. 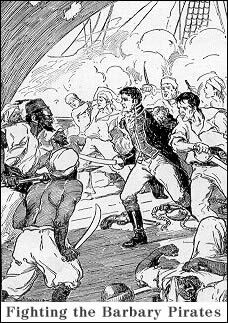 Jefferson refused and sent over the U.S. Navy and Marines in the First Muslim Barbary Pirate Wars. 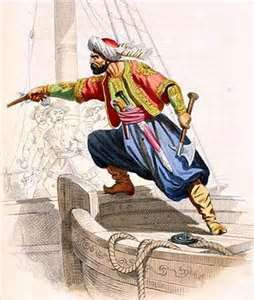 "Tripoli ... of the Barbary States ... permitted itself to (announce) war on our failure to comply ... The style of the demand admitted but one answer. 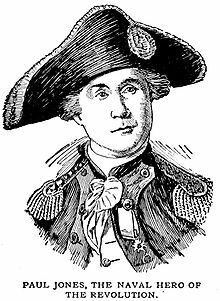 I sent a small squadron of frigates into the Mediterranean ... We are bound with peculiar gratitude to be thankful to Him that our own peace has been preserved through a perilous season." 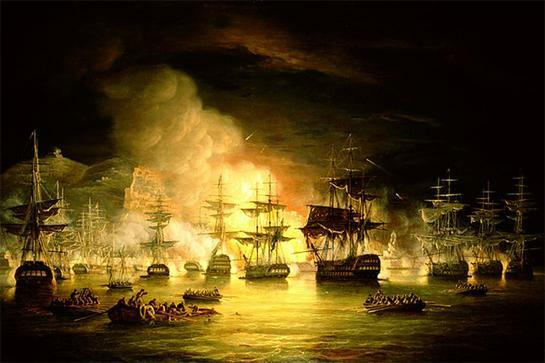 The victory is remembered in the Marine hymn line "to the shores of Tripoli." 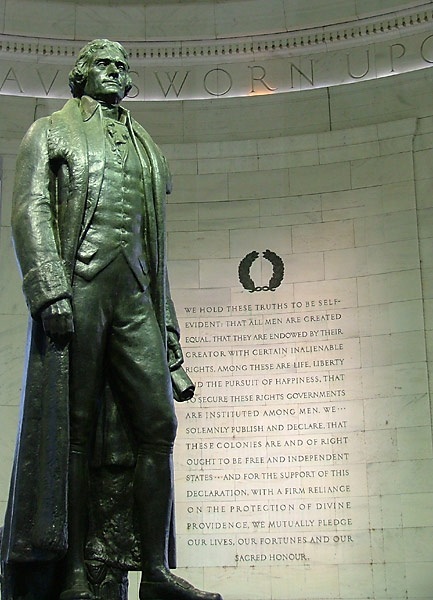 Jefferson took a public stand for religious freedom. 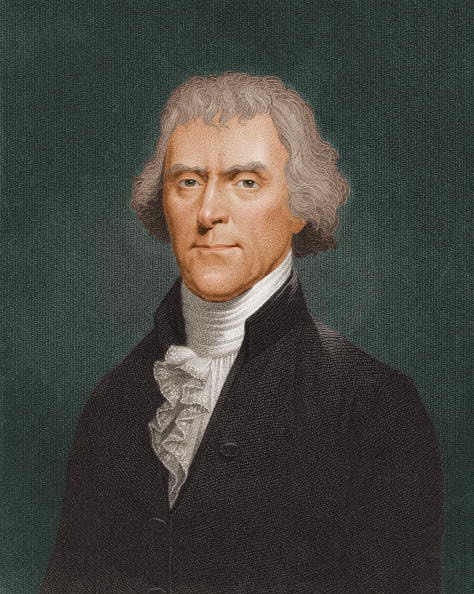 On May 24, 1774, Thomas Jefferson drafted a Virginia Resolution calling for a Day of Fasting, Humiliation and Prayer to be observed the day British ships blockaded Boston's harbor. 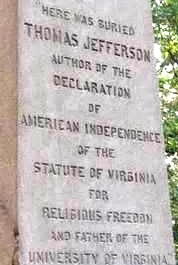 In 1777, Jefferson organized the independent Calvinistical Reformed Church, which met in the Charlottesville Courthouse. 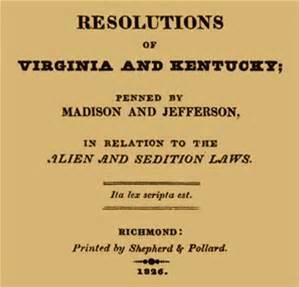 That same year, fellow church member Col. John Harvie introduced Jefferson's Bill for Religious Freedom in the Virginia Legislature. 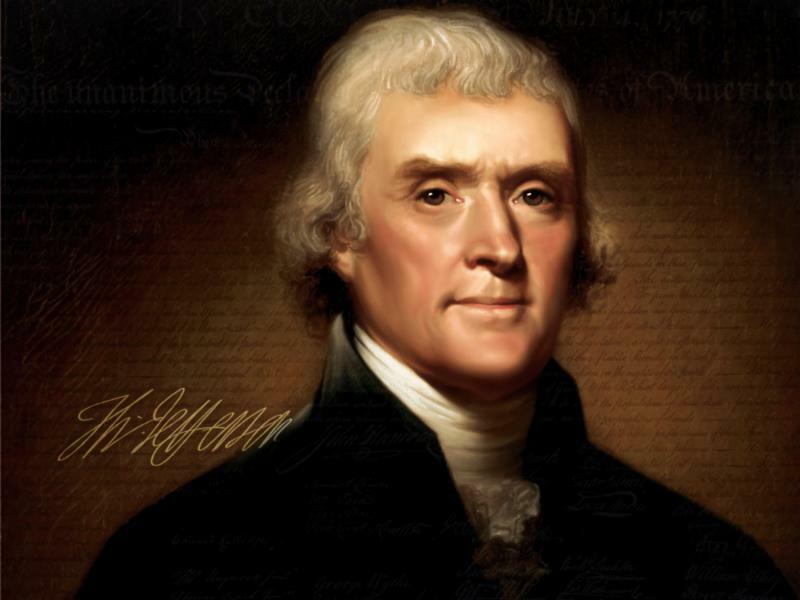 Jefferson would not have allowed Islam's "ridda" apostasy laws which impose the death penalty for those leaving Islam. who being Lord both of body and mind, yet chose not to propagate it by coercions on either, as was in His Almighty power to do, but to extend it by its influence on reason alone." and above all, that he hath diffused the glorious light of the Gospel, whereby, through the merits of our gracious Redeemer, we may become the heirs of his eternal glory. Given under my hand and the seal of the commonwealth, at Williamsburg, this 11th day of November, in the year of our Lord, 1779, and in the fourth of the commonwealth. 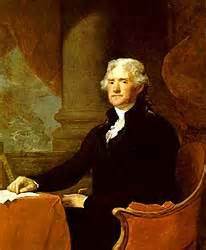 -THOMAS JEFFERSON"
In 1803, Jefferson approved purchasing the Louisiana Territory from Napoleon, doubling the size of the United States. He sent Lewis and Clark to explore it, 1804-1806.
and the United States will further give the sum of three hundred dollars, to assist the said tribe in the erection of a church." 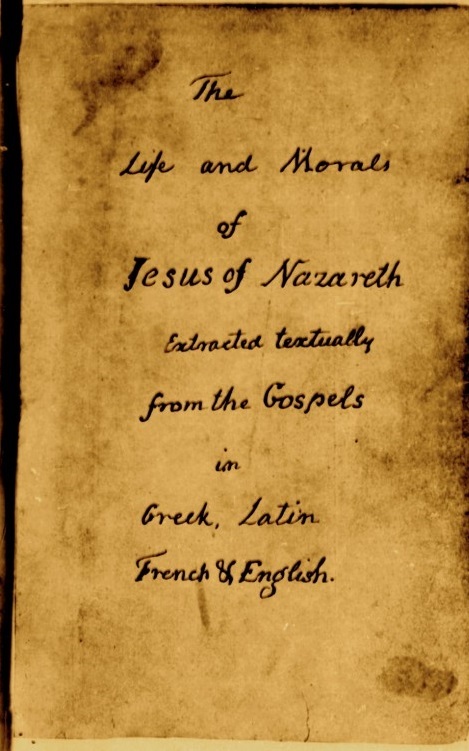 Jefferson compiled The Life and Morals of Jesus of Nazareth Extracted Textually from the Gospels in Greek, Latin, French and English first in 1804, then again in 1816. 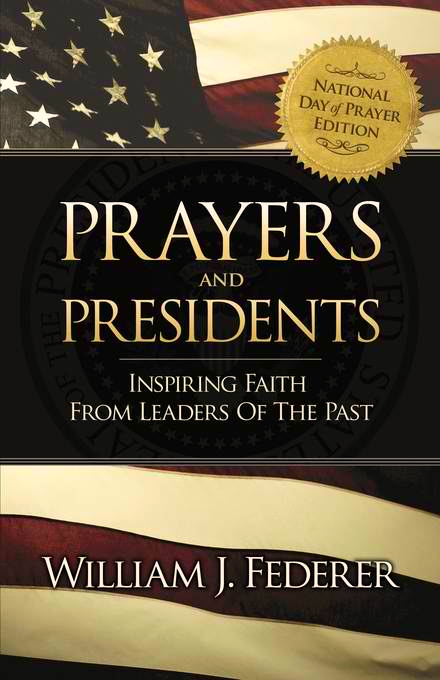 He initially prepared this with the intention of having a book of ethics to help Christianize and civilize the Indians, reasoning that if they were given the entire Bible, they may want to emulate the Old Testament stories of warfare. 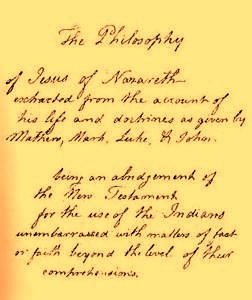 "The Philosophy of Jesus of Nazareth -- extracted from the account of his life and doctrines as given by Matthew, Mark, Luke & John -- being an abridgement of the New Testament for the use of the Indians unembarrassed with matters of fact or faith beyond the level of their comprehensions." "I have made this wee-little book ... which I call The Philosophy of Jesus. It is a paradigm of his doctrines, made by cutting the texts out of the book and arranging them on the pages of a blank book, in a certain order of time and subject. A more beautiful or precious morsel of ethics I have never seen; it is a document in proof that I am a real Christian, that is to say, a disciple of the doctrines of Jesus, very different from the Platonists, who call me an infidel, and themselves Christians and preachers of the gospel, while they draw all their characteristic dogmas from what its Author never said nor saw." 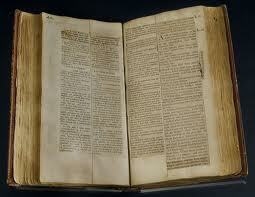 He held that the Bible contained the noblest ethical system the world has known. 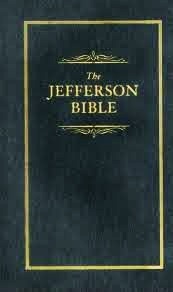 His own compilation of the selected portions of this Book, in what is known as Jefferson's Bible, bears evidence of the profound reverence in which he held it." 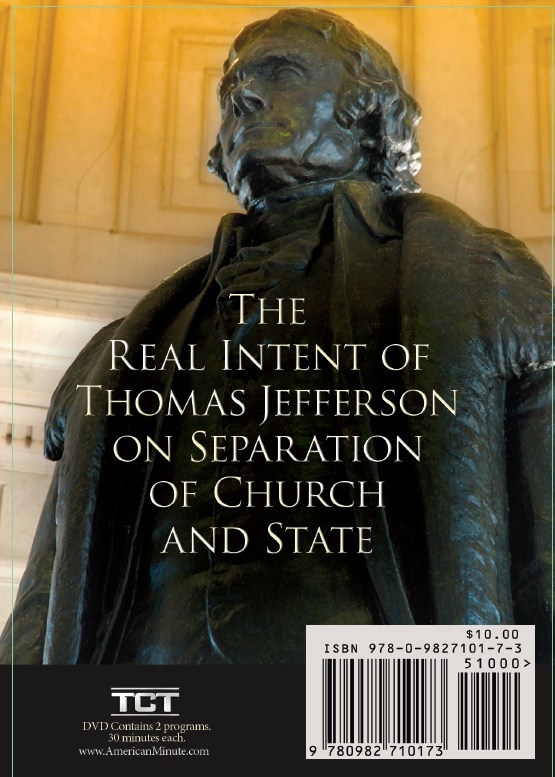 "That there be printed ... for the use of Congress, 9,000 copies of Thomas Jefferson's Morals of Jesus of Nazareth, as the same appears in the National Museum." "Of all the systems of morality, ancient or modern, which have come under my observation, none appear to me so pure as that of Jesus." "I hold the precepts of Jesus as delivered by Himself, to be the most pure, benevolent and sublime which have ever been preached to man. "His system of morality was the most benevolent and sublime probably that has been ever taught, and consequently more perfect than those of any of the ancient philosophers." "The doctrines that flowed from the lips of Jesus himself are within the comprehension of a child." 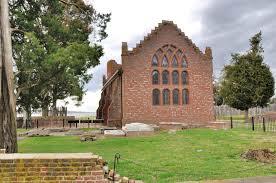 Jefferson lived in Virginia, which had the Anglican Church established from 1606 to 1786. 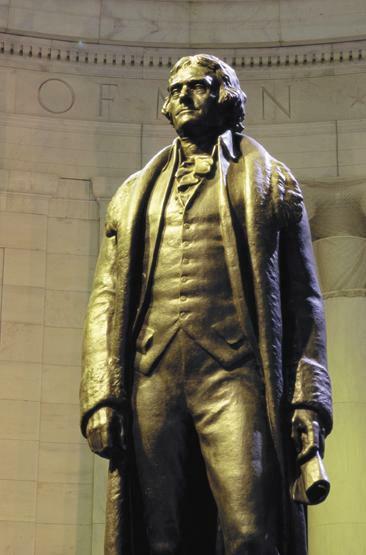 Establishment meant mandatory membership, mandatory attendance, mandatory taxes to support it, and no one could hold public office unless he was a member. 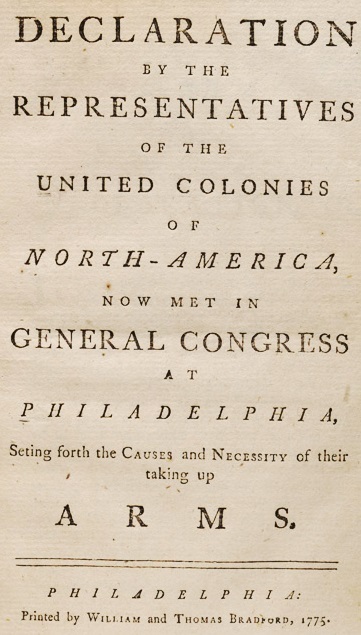 Other Protestant Christian denominations were considered 'dissenters' and Catholics were prohibited from entering the colony. With the King of England being the head of the Anglican Church of England, there were conflicting allegiances for Anglican clergy during the Revolution, with many siding with the King. "I consider the doctrines of Jesus as delivered by himself to contain the outlines of the sublimest system of morality that has ever been taught but I hold in the most profound detestation and execration the corruptions of it which have been invented." "In extracting the pure principles which Jesus taught, we should have to strip off the artificial vestments in which they have been muffled ... there will be found remaining the most sublime and benevolent code of morals which has ever been offered to man." 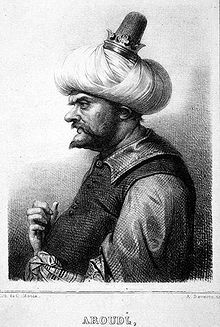 "My views ... are the result of a life of inquiry and reflection, and very different from the anti-christian system imputed to me by those who know nothing of my opinions. To the corruptions of Christianity I am, indeed, opposed; but not to the genuine precepts of Jesus himself. I am a Christian in the only sense in which he wished any one to be; sincerely attached to his doctrines in preference to all others ..."
2. His moral doctrines ... were more pure and perfect than those of the most correct of the philosophers ... gathering all into one family under the bonds of love, charity, peace, common wants and common aids. A development of this head will evince the peculiar superiority of the system of Jesus over all others. 3. The precepts of philosophy, and of the Hebrew code, laid hold of actions only. He pushed his scrutinies into the heart of man; erected his tribunal in the region of his thoughts, and purified the waters at the fountain head. 4. He taught, emphatically, the doctrines of a future state ... and wielded it with efficacy as an important incentive, supplementary to the other motives to moral conduct." "The doctrines of Jesus are simple, and tend all to the happiness of man. Now, which of these is the true and charitable Christian? He who believes and acts on the simple doctrines of Jesus? ... "
How much wiser are the Quakers, who, agreeing in the fundamental doctrines of the gospel, schismatize about no mysteries, and, keeping within the pale of common sense, suffer no speculative differences of opinion ... to impair the love of their brethren." 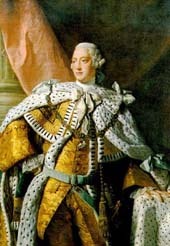 "Another plea for Episcopal government in Religion in England is it's similarity to the political government by a king. No bishop, no king. This then with us is a plea for government by a presbytery which resembles republican government. The clergy have ever seen this. The bishops were always mere tools of the crown. 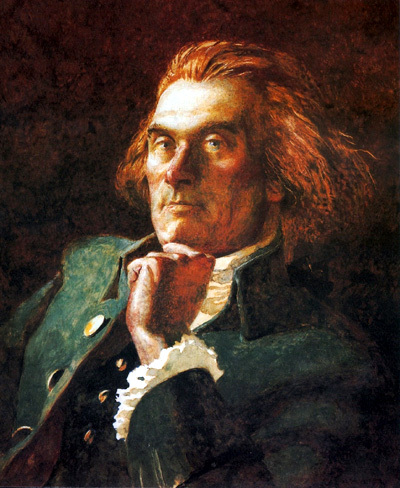 The Presbyterian spirit is known to be so congenial with friendly liberty, that the patriots after the restoration finding that the humour of people was running too strongly to exalt the prerogative of the crown promoted the dissenting interest as a check and balance, & thus was produced the Toleration Act ..."
"The Gentiles have the law written in their hearts, i.e. the law of nature: to which adding a faith in God's & his attributes that on their repentance he would pardon them, they also would be justified. This then explains the text 'there is no other name under heaven by which a man may be saved,' i.e. the defects in good works shall not be supplied by a faith in Mahomet Foe, or any other except Christ ..."
The care of every man's soul belongs to himself. But what if he neglect the care of it? Well what if he neglect the care of his health or estate, which more nearly relate to the state. Will the magistrate make a law that he shall not be poor or sick? Laws provide against injury from others; but not from ourselves. God himself will not save men against their wills." 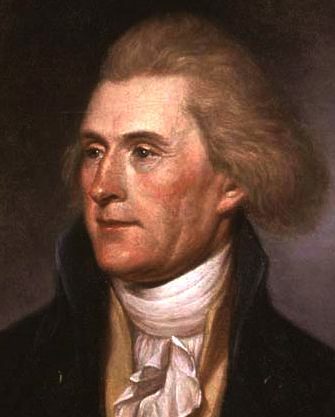 We most solemnly, before God and the world, declare ... the arms we have been compelled by our enemies to assume, we will ... employ for the preservation of our liberties; being with one mind resolved to die freemen rather than to live slaves." Each State has a natural right ... to nullify of their own authority all assumptions of power by others within their limits; that without this right they would be under the dominion, absolute and unlimited, of whosoever might exercise this right of judgment for them." 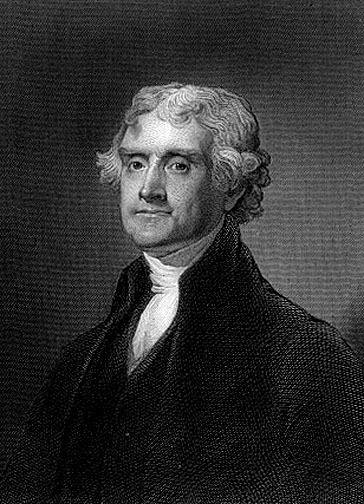 Someone once said that Thomas Jefferson was a gentleman of 32 who could calculate an eclipse, survey an estate, tie an artery, plan an edifice, try a cause, break a horse, and dance the minuet." 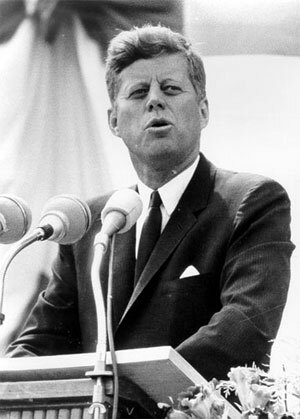 "I shall need, too, the favor of that Being in whose hands we are, who led our forefathers, as Israel of old." "God who gave us life gave us liberty. 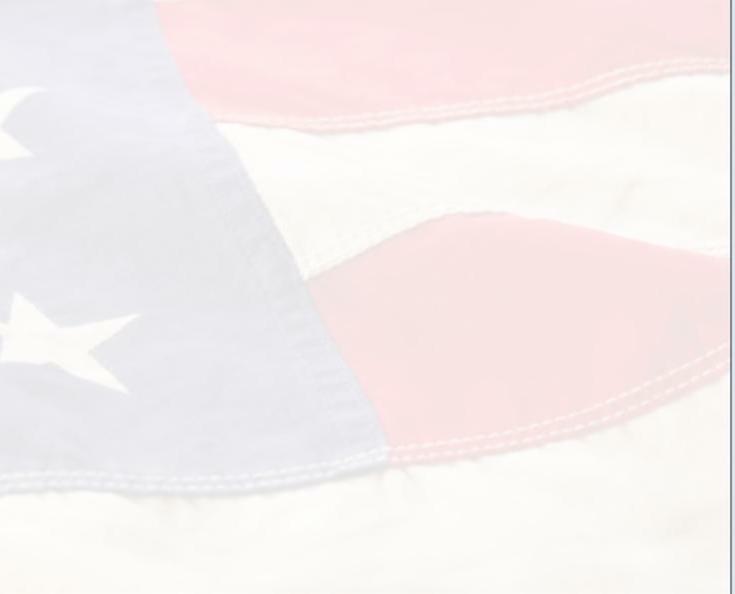 Can the liberties of a nation be secure when we have removed a conviction that these liberties are the gift of God? 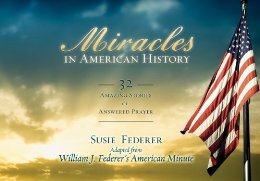 Indeed I tremble for my country when I reflect that God is just, that his justice cannot sleep forever."